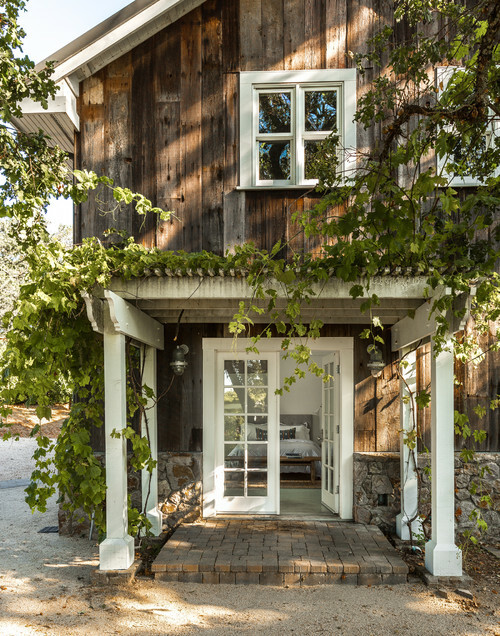 On the outside, a portion of today’s California farmhouse embraces rustic appeal with its rough-hewn siding. But step inside and you’ll be delighted by its light and airy ambiance. 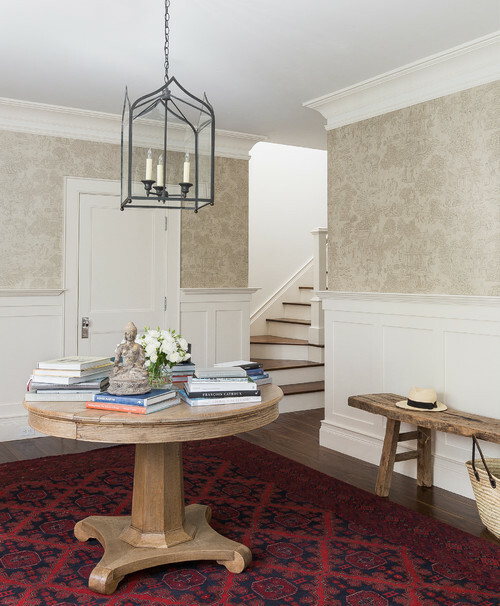 A traditional foyer greets you with a colorful patterned rug and simple round wood table stacked with favorite books. A subtle wallpaper adorns the walls above board and batten trim. The use of red continues into the living room where expansive windows and plenty of white create a cheerful, light-filled space. French doors provide a view of the mountains in the background. 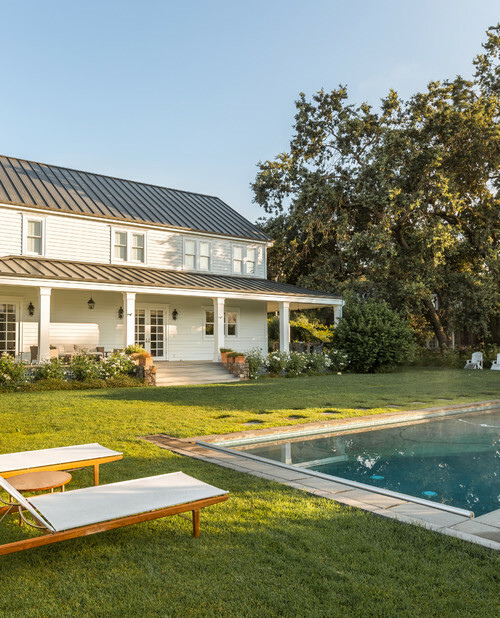 Today’s California farmhouse is located just north of San Francisco and enjoys amazing vistas. 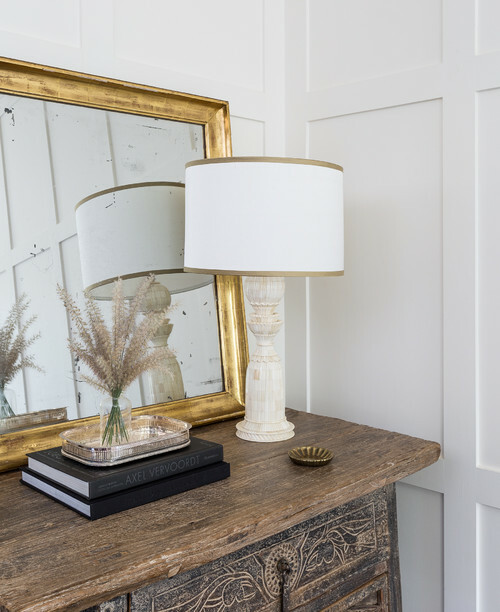 A gilded mirror lends a touch of glam to a rustic dresser. I love the mix of opposites in a home – it always creates visual and tactile interest. 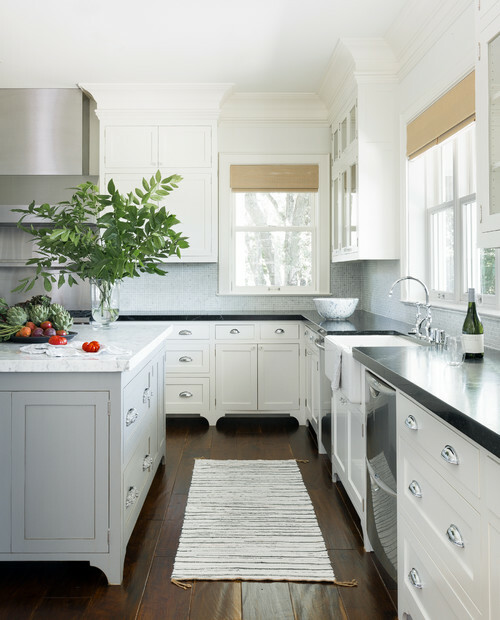 A clean fresh look takes residence in the kitchen with plenty of natural light, an ample kitchen island, a farmhouse sink, and warm wood floors. Cross back chairs snuggle up to the dining table; the pendant light is the same as the one suspended in the foyer. Your eye flows easily from one room to the next. Plenty of storage has been incorporated into this lovely California farmhouse. 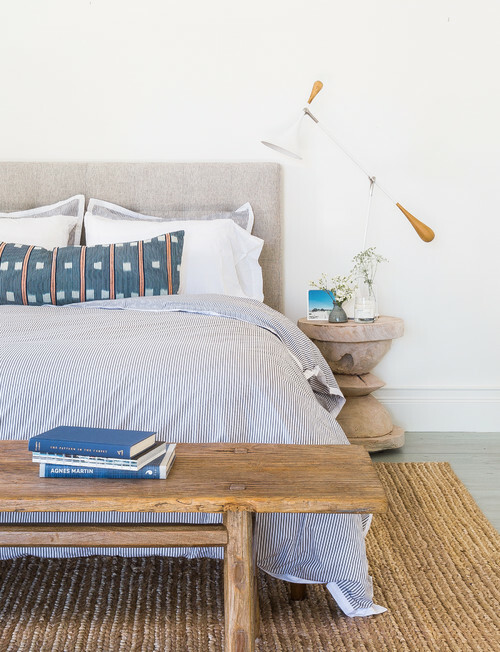 A clean and fresh decorating approach has been applied to the bedrooms in today’s home. Simplicity is key to achieving the look. More views of the mountain vistas can be enjoyed while lounging in bed on a lazy weekend morning. The backyard enjoys an expansive pool. I like the treatment of grass surrounding the pool as opposed to a large cement patio. It feels more organic and country to me. 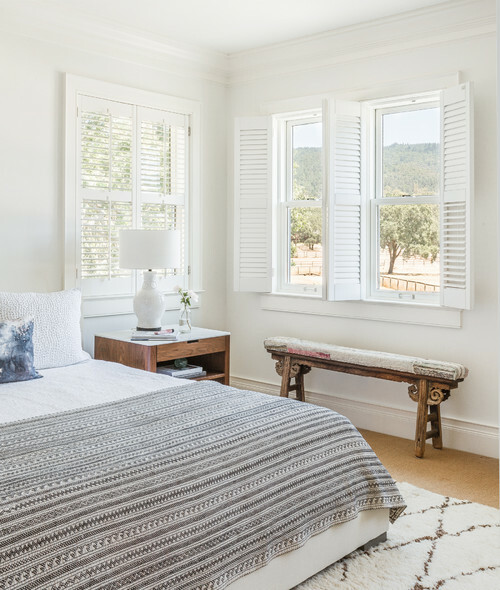 You can see more of this stunning California farmhouse by Cassandra Crain Design over at Houzz. From a mountain girl in Western North Carolina, I feel totally at home! Beautiful! I love the light, airy, simplicity yet sophistication of your home!